Anyone running for a local elected office will find this title a valuable resource for organizing and running a campaign. Local office is where most candidates launch their careers, and The Campaign Manager is one of the books they should read before jumping in. 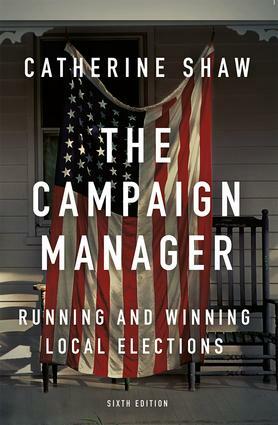 Campaigns and Elections, "Ten campaign books everyone should read"
I can't imagine anyone heading into the campaign trenches without a copy of The Campaign Manager! A comprehensive guide to all aspects of modern campaigns, from strategy to understanding voter contact techniques, to fundraising, paid and earned media, to get-out-the-vote-drives. Practical, witty, and fact-packed. This is the bible of campaign management. Arguably the most comprehensive, insightful, and useful compendium of local campaign wisdom ever assembled. Thinking of running for local office? Stop, and buy this book. It will tell you how to win, or at least what you must do if you want to win. Just as important, it will tell you when you are wise not to run. Shaw presents an excellent how-to guide for the prospective campaigner. From strategic orientation to voter targeting to media, Shaw provides a step-by-step process to getting a campaign off the ground. Shaw's book should be read by all persons interested in entering elective office at the local level. It is also an excellent supplementary text for a course on American political campaigns. One of its major strengths is the focus on local political campaigns, which are often overlooked when presidential and statewide elections are held. It is the definitive guide to campaigning at the local level. Quite simply the best organizational tool for anyone seeking political office or working on an issue-based campaign. Catherine Shaw served twelve years (three terms) as mayor of Ashland, Oregon, and four years as a member chief of staff in the Oregon legislature. She has over two decades of campaign management experience, and has taught campaign courses at Yale, the University of California, and Southern Oregon University.